In May of this year, Texas passed HB 3994, a law making it nearly impossible for pregnant minors to obtain abortions without parental consent. For good measure, the Texas Supreme Court has now released an additional set of rules that could land those pregnant minors in legal limbo pretty much forever, or at least—as it probably the intention—until it’s too late in the pregnancy to matter. The new rules govern the judicial bypass procedure, which abused or neglected minors can use to ask a judge for permission to get an abortion without parental consent. But they completely remove a section of the current law that requires a judge to rule on a bypass request within two days. Judges now have five days to rule. And where a bypass was once automatically granted if the judge didn’t respond, the case will now be “deemed denied” if they don’t issue a ruling. “Judicial bypass protects vulnerable pregnant teens who cannot find or safely turn to a parent,” said Tina Hester, executive director of Jane’s Due Process. “But the legislature and Governor Abbott decided to go after abused and neglected pregnant teens by amending this law.” HB 3994 passed the state legislature and was signed by Governor Greg Abbott on June 12, 2015. The new law imposes far-reaching restrictions. Most significantly by removing the enforcement of deadlines for the judge to rule, effectively allowing a judge to stall out a minor until she can no longer obtain a legal abortion. “When a minor cannot even get a hearing or a court ruling in time, the state is then making her decision for her. Such abuse of state power amounts to an “absolute veto” of her decision and is under U.S. Supreme Court precedent unconstitutional.” Hays said. You’d be hard-pressed to create a worse situation for vulnerable pregnant teenagers, but knowing Texas, they will find a way. 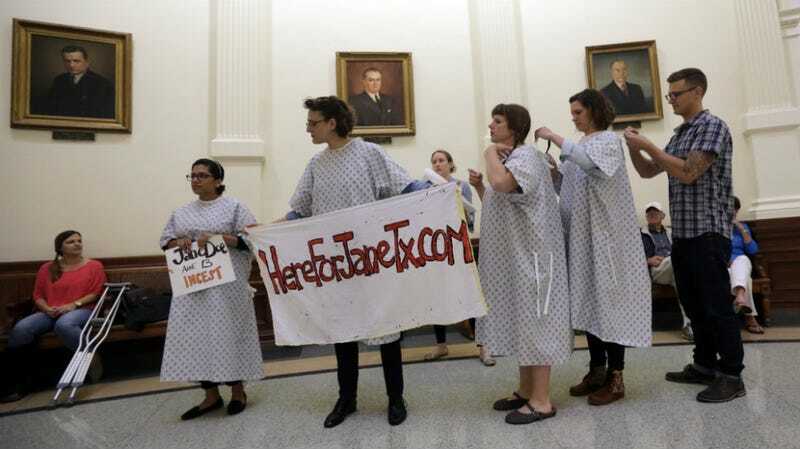 Activists tie on hospital gowns as they prepare to protest House Bill 3994 in the rotunda of the Texas Capitol, Friday, May 22, 2015, in Austin, Texas. Image via AP.